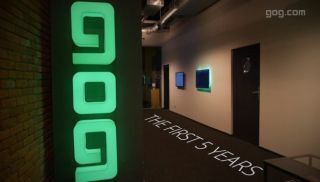 Last September, GOG.com celebrated its fifth anniversary. That meant five years of easy access to DRM free classics, five years of not having to endlessly tinker to get old games working on modern systems, and five years of being able to say "gog" without people giving you a funny look. All things worth celebrating, which is why the digital distribution service has released a retrospective video, which briefly tells the story of those five years. Quick game: try to guess how many times they say "DRM-free". Of course, no exploration of GOG's history would be complete without a mention of the time they pretended to shut down , in order to relaunch days later with a new site design and the addition of Baldur's Gate to their store. In the video, co-founder Marcin Iwiński confirms what probably needn't be: they aren't planning to do that again. Probably for the best. Despite that misguided instance of hype generation, it's otherwise easy to root for GOG as a service. It provides a nice mixture of old and new games, with, as they repeatedly say, no DRM and a nice selection of bonuses. All that, without the need for another client, and with a commitment to making the games work on modern PCs. Good job, those guys.